New York, NY (February 9th, 2019) — This season, Oxford Fashion Studio will take over Pier 59 Studios on February 9th to present Autumn/Winter 2019 collections from 12 independent fashion designers from all over the globe. Oxford Fashion Studio serves as a platform to guide brands to the next level with their group runway show concept. Three shows will run throughout the day in Pier 59’s Studio B, and between shows industry members are encouraged to mingle with the designers themselves and view the collections up close continuing their mission to promote independent fashion for the good of creativity. Oxford Fashion Studio is excited to announce both OFS veterans and newcomers to their roster this season at New York Fashion Week. See below for information on each of the designers who will be showing with us this season and the inspirations behind their collections. Chaahat Thakker is a young multidisciplinary creative working in New York City and a recent graduate from the Maryland Institute College of Art. 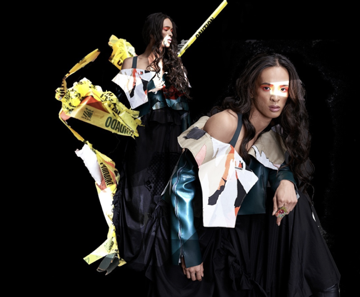 Armed with a diverse visual arts background, Thakker explores fashion as equal parts wearable art and functional design. She seeks out unconventional sources of inspiration, such as her collection of discarded scraps and miniature objects. Poli & Jo was born out of East End of London, Spitalfileds – the birth seed of edginess, coolness and creativity. 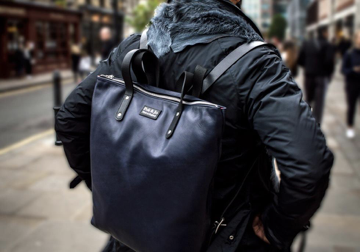 Their vision is to create bags that are functional, practical and aesthetically pleasing, but have an edge and stand out from the crowd with the occasional outrageous design that is just cool. Poli and Jo work with artisans and manufacturers based in England to produce their collections creating a sustainable product inspired by their British Heritage. FarahNaz has an Haute Couture, and high-end Ready to Wear apparel in the most luxurious fabrics. The two collections feature intricately handcrafted treatments and custom embellishments of the highest quality standards that fuse Eastern and Western culture for a new modernity. FarahNaz is passionate about the environment and the brand has dedicated one exclusive line just for the eco-friendly products. 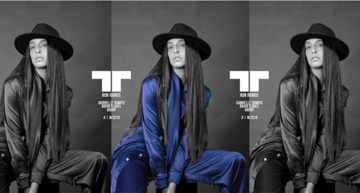 Ron Ramos New York is a design label that embodies the idea of effortless beauty and contemporary forms. He dresses women in tailored lines to express a stalwart and confident appeal to compliment the grace and poise women exemplify. Inspired by the streets of Williamsburg, head designer Seray Sacan believes in the cyclical relationship humans have with the earth, and has made sustainability a pillar of Minzkou’s company philosophy. By using cruelty-free silks, naturally dyed fabrics, and recycled materials, Sacan incorporates her eco-friendly ethos into each piece she designs. The brand is also known for its intricate weaving, beading, knitting, and embroidery, most of which is done entirely by hand. Whenever I walk on the street in New York, I often can see this sign “Post No Bill” around construction area. This Irony was so interesting to me; even ugly and damaged things can be recreated into beautiful things, looking with creative eyes. Ugliness and beauty cannot be separated but linked as the cycle of life and death continues. Jyu Ri Lee was born as the first child among three of a Korean conservative family. As an obedient and long-suffering first child, she followed her father’s advice to the letter, working for the government. She realized she had to break this chain of delayed dreams; she was compelled to pursue her own passion. She resigned from her secure post, to pursue her passion in Parsons School of Design: she was 31 when she started her first fashion sketch. This passion led her to win competitions like Eyes on Talent (May.2018.NewYork) and Graduate Fashion Week (June.2018.London) featured in different magazines including Vogue Italia, Kodd magazine and Huf magazine. Her collections are often inspired by strong women: who are independent, knows what she wants in life, fights for it, and achieves it against all odds. Doyeon Yoni Yu was born and raised in South Korea before she moved to New York. She’s bringing those experiences into her designs and unapologetically designing fashion for all types of bodies. Her creations are to truly celebrate body equality and liberate us all from this fat phobic society. Moreover, she provides choices that we’re missing in plus size market. A lover of fashion, Delayne Dixon created DIXON after graduating from The Art Institute of Vancouver in 2012. Her brand is inspired by empowered women who aren’t afraid to step out of societal standards. DIXON has had the pleasure of styling artists such as Serena Ryder and Marilyn Manson. Meg Beck was born in 1994 and grew up in Landenberg, Pennsylvania. She is an interdisciplinary artist and designer whose work is rooted in exploring femininity and gender politics. Gymshorts, her first collection, debuted at D.C. Fashion Week. Meg lives and works in Baltimore, Maryland. Pheren Couture was founded by designer Pheren Soepadhi in 2011. She is a multiple award-winning Haute Couture designer, Wedding Accessory designer and Fashion Photographer. Pheren was born in Jakarta, Indonesia, but she is now based in Los Angeles. Her craft is entirely inspired by historical fashion, fantasy, architectures from Romanesque to Rococo era, nature and music; romantic but doomed. When clothing lines become steeped in other preexisting creations, it becomes challenging to identify your own style personality. Nina knows this struggle all too well, which is why she pulls from her storied life for your next favorite outfit. Born in Milan and raised in Shanghai, Nina D. Quantas moved to the U.S. as a teenager. Even then, her interests were sewing, designing, and creating daily wardrobes which led to a lifetime of redefining what it means to dress feminine without losing sight of what makes you an individual. Nina pursued a degree in architecture where she discovered how sharp edges can reform with color and soft textiles and how architecture can then be integrated with fashion. Seamlessly combining timeless inspirations and modern aesthetics, our meteor collection has bold looks that illuminate any occasions for urban women, like a meteor shine cross the city. Oxford Fashion Studio presents independent and emerging global fashion brands to press and stockists through a runway show platform around the world. Its team of curators reviews more than 40,000 designers a year issuing invitations to brands with original concepts to present their collections in the world’s four fashion capitals. They are experts on these cities and the global fashion currents that flow through them. OFS has produced over 100 runway shows presenting more than 6000 looks across New York, London, Milan and Paris. For more information please visit https://www.oxfordfashionstudio.com/ or follow along on Instagram at @oxfordfashionstudio. Previous articleWin our “Five Faves” for February!